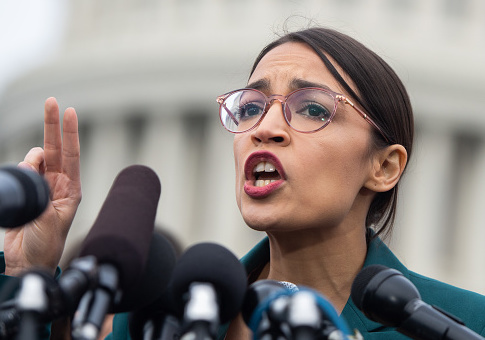 Rep. Alexandria Ocasio-Cortez (D., N.Y.) attacked Senate Republicans Monday for sitting on a bill that in actuality has not passed the House of Representatives. Ocasio-Cortez received thousands of retweets for a tweet claiming that the "For the People Act" had passed the House with over two hundred cosponsors. "Now it’s at the Senate," she wrote. "GOP is calling getting money out of politics a ‘power grab.'" Ocasio-Cortez responded by adding a "quick correction" in the replies to the tweet, while leaving the erroneous tweet up. Ocasio-Cortez is correct that the bill has been criticized by Senate Republican leaders. In a January op-ed, Majority Leader Mitch McConnell called the bill the "Democrat Politician Protection Act" and cast the election reform measures as "tailor-made by Washington Democrats to help their D.C. attorneys descend on local communities, exploit confusion and try to swing elections." This entry was posted in Issues and tagged Alexandria Ocasio-Cortez, Campaign Finance, Mitch McConnell. Bookmark the permalink.